Pipì breaks a promise to his father and leaves the safety of the forest. When a crocodile bites off his tail, he feels too ashamed to go home. A series of crazy adventures ensue, leading him to Master Alfred, a boy who wants Pipì to be his personal servant. Pipì promises to stay with him, but sneaks out of the house that night to bid his family farewell. Ticklythroat, an evil bandit with a promise of his own to keep, catches him. Just as Pinocchio’s nose returned to size when he stopped lying, Pipì got his tail back when he kept his promise. But though Pinocchio got his wish to become a real boy, Pipì decided he’d rather stay a monkey. The story of Pipì was written immediately after Pinocchio and is connected to it in a few ways – some obvious, others less so. 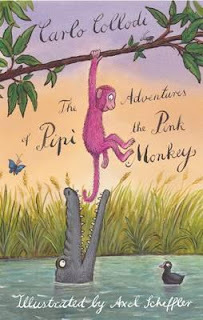 Readers will no doubt recognise the mischievous monkey’s dishonesty and disobedience, along with the zany adventures. Appearing in both stories is the Turquoise Fairy, who guides Pinocchio and Pipì with her wisdom. The greatest connection lies in the character of Master Alfred though, who (in one giant clue) even reads ‘The Adventures of Pinocchio by Carlo Collodi’ to Pipì. Though not explicitly stated in the story, an amusing letter by Collodi to his fans (included in the back of the book) reveals Master Alfred to be Pinocchio himself! The endearing illustrations by Axel Scheffler (illustrator of The Gruffalo) are immediately recognisable. Inside, they appear classically, in sepia, though Pipì is delightfully coloured pink throughout. The book includes a section at the back with background information about the story, a list of famous fictional apes, a short quiz and a glossary of ‘monkey language’. This story will appeal to children aged 8–11 years, though any fan of Pinocchio will appreciate it.